Need more information about booking Home 9053235 ? 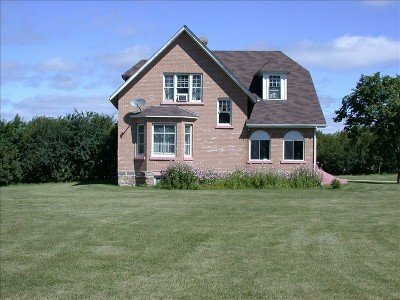 Tummel House is a beautiful private country home located 5 minutes drive south of Roblin Manitoba, and only 15 minutes from Asessippi Ski Hill -perhaps the best ski hill on the prairies. It is close to Lake of the Prairies where there is great fishing and boating, and it is within 30 minutes of the Duck Mountain Provincial Parks (Madge Lake and Child's Lake). Excellent golf courses are also located close by, as well as top-notch hunting and snowmobiling experiences. Tummel House was built in 1921 and it has all the charm and interest of its era. Lofty ceilings & rich wood finishings are just a few unique aspects of this 2500 square foot house. The spacious dining room & living room are great for family gatherings. Four large bedrooms and 2 bathrooms, along with a fully equipped kitchen (minus a dishwasher) round out the home. Large lawns (6 acres) offer space for outdoor activities, along with a fire pit & BBQ. I am available to answer questions via phone, text or email during your stay. If issues arise, I have family members close by who will help you. All this information will be provided after a booking is made. We do not allow any parties. Guests must treat the house and grounds with care, given the unique characteristics of the property. Pets are allowed in the yard and in limited parts of the house. Please contact owner for restrictions.